simplebricks thanks! you've given me allot to think about and I've made some changes accordingly and will continue to as I play test. A few of my overall thoughts. I agree on Putrid Imp but Wild Mongrel actually feels like the best turn 2 play? it leads to extremely explosive starts if you turn 1 existence into imp. 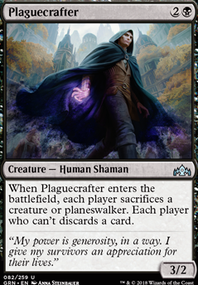 I have a fear of decking my self which is why I added Battlefield Scrounger , is that a pretty rare situation? skyland on Minotaurs in Pauper! I agree with RedmundR2 in general. 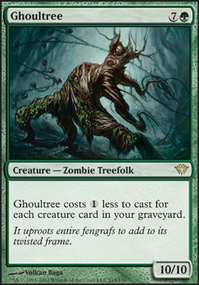 The concept of this deck is not something you're going to be able to create competitively in modern. I truly believe you should play with what you love, and if that is casual then by all means continue. The deck still seems fun. 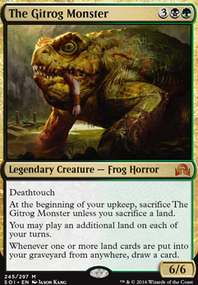 However, there is a deck that may be similar that you can play competitively in modern. One of my favorite combo decks in modern: Grishoalbrand (from Griselbrand and Nourishing Shoal). Seeing as you did not know about the legality of some cards I'm going to assume you are somewhat new to Magic. Disclaimer, this deck is NOT something you can just simply pick up and win at your local FNM. It does require a little bit more knowledge of the rules as well as competitive level thinking. However, if that is a route you want to, start with the deck you want to learn and keep playing until you've figured it out. This deck as many similar concepts to the deck you're trying to build. Also, this is simply one primer. There are more if this one doesn't "click" to you. In saying all of that, if you want to get this deck more tuned to modern you will need to remove the illegal cards which I see you have taken most out. Pattern of Rebirth and Wild Mongrel NOT modern legal, and Golgari Grave-Troll is specifically banned. Before I continue with suggestions Karnival, are you willing to explore other colors? How competitive do you want to be, if at all? Do you have a budget I will need to remember for suggestions? I've said this multiple times, sorry to say it again. Play with what you like. If you're more of a casual player with friends, this deck is fine. 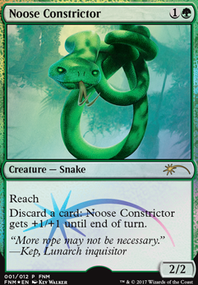 If you want to try and start competing at modern FNMs, I'm sure we could help try to find tune your deck (with whatever concepts you want to keep). If you want to truly start getting competitive, let us know. We can offer multiple decks that you might like to start and try. I've considered Wild Mongrel but it just isn't good enough for this deck. We don't actually want to discard; we just want to play threats until our opponent runs out of removal. 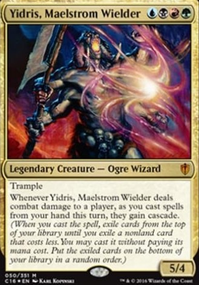 I've chosen to avoid discard for this deck since that conflicts with our Midrange philosophy. I want to get as much value as I can out of my cards-in-hand and not focus too much on throwing them into the graveyard as we can get them there incidentally. That also makes us much more resilient to graveyard hate since we're not putting much conscious effort into getting it stocked in the first place. 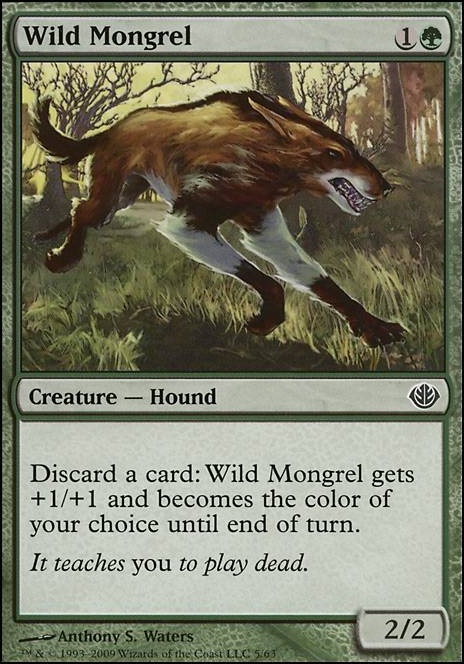 That said, Wild Mongrel is interesting since you do actually get a benefit for throwing your cards away, but ultimately I like our other 2-drops more. It would be great in an Aggro version of this deck. Putrid Imp would be glorious in this deck, too. Cards like that and Mongrel would also open you up to Grave Scrabbler. There's also cycling stuff like Street Wraith and Unearth, which is an additional way to get back your Stinkweed or Shambling Shell and fits the Sorcery slot nicely for Delirium.